On May 28, it was a Black and hurriedly forgotten Thursday in Lagos as tragedy struck at the popular Otedola Bridge along the ever busy Lagos-Ibadan expressway. According to reports, a 33,000-litre articulated vehicle heading towards Ibadan had a break failure, skidded off the road and in the process had all its content spilled all over the road. Within seconds, there was a deafening explosion which officials alleged claimed nine lives and resulted into razing of about 67 vehicles. Reports have it that some motorists abandoned their vehicles and fled in different directions as the inferno gathered momentum and there was panic across the scene. A most pathetic case was that of a woman who allegedly wailed uncontrollably as she was searching for her twin girls. Seeing part of the episode on Television, it was such a gory sight that will certainly make hearts of steel to melt. The tragedy, which occurred around 6pm while most workers were returning home, led to a huge traffic gridlock that crept deep into the night, with most people getting home around 2:00 am or thereabout. The cost of the ill-fated incident is obviously enormous. Indeed, many are still counting their losses. Characteristically, a lot of people have alluded many probable reasons as being responsible for the sad incident. One of such is a superstitious assertion that the Otedola Bridge is jinxed. Proponents of this view readily point to several gory carnages that have taken place around the now mythical Otedola Bridge. For instance, they recounted a case of the horrific episode of a newly wedded couple who had a brutal accident on the Bridge, leading to the instant death of the groom, with the bride helplessly watching the corpse of her husband of one day by the roadside. However, while it is true that the Otedola Bridge has recorded quite a number of bloody road accidents, it will be too simplistic to allege that carnages occur along the Bridge because it is jinxed. Truth be told, disasters on the Bridge are mostly products of human errors and carelessness. The Otedola Bridge is a slope that must be cautiously navigated by motorists. What usually happen is that most motorists, especially drivers of articulated vehicles descend the slope with such startling speed that it becomes a major problem gaining stability once an unforeseen mechanical fault occurs. Articulated vehicles drivers in particular need to be more careful and professional in their operation. Across the country, they are mostly notorious for the sloppy manner they function. Findings have shown that several carnages recorded on most roads in the country have been caused by their complicity. A recent research has indicated that out of about 358 transport accidents recorded in Nigeria between 1999 and 2002, 70 % involved articulated trucks and heavy-duty vehicles. The survey further shows that about 32 per cent of truck drivers are below 30 years of age and probably immature and inexperience to handle such psychologically demanding task. Also, studies have equally confirmed that 62 per cent of fuel trucks involved in serious road mishaps that resulted in monumental disasters were of poor quality which probably aided fire outbreaks whenever there was an accident. Study has also shown that about 54 per cent of fuel spilling that had led to fire outbreaks was as a result of negligence on the part of truck drivers. For obvious reasons, Lagos will continue to attract articulated vehicles and trucks of all shades because of its prime socio-economic status. Lagos accounts for over 60% of Nigeria’s industrial and commercial activities; 70% of national maritime cargo freight, over 80% of international aviation traffic and over 50% of Nigeria’s energy consumption. The two seaports in Lagos account for 70 percent of the sea trade in the country. With all these indicators, it would be difficult, for now, to banish articulated vehicles and trucks on Lagos roads. However, with the cooperation of major stakeholders in related sectors, the havoc being wrecked on lives and properties by articulated vehicles on residents in the State could be grossly reduced. For instance, the continuous importation of locally consumed fuel in the country, arising from the inability of the Federal Government, over the years, to fix local refineries places serious burden on the State. With more than 50 fuel depots in Lagos alone, at least over 3,000 trucks travel to the State on a daily basis with the intention of lifting petroleum products. To redress the current trend, the Federal Government would need to urgently revive all national refineries or encourage investors to build new ones as Dangote is currently doing along the Lekki Free Trade Zone axis . Continuous importation of fuel, no doubt, will exacerbate the pressure on road infrastructure across the country. Various stakeholders in the oil sector need to ingeniously look into the petroleum distributive arrangement to evolve a more scientific and less cumbersome order of distribution. Equally, we need to invest massively in the infrastructure development of the transportation sector. Investment in transportation infrastructure enhances private sector activities as it lowers operational cost; enhances productivity, job and wealth creation through exchange of goods and services. Infrastructure development in the sector is, therefore, critical to achieving human capi- tal development and safety in the country. One vital way through which this could be done is for us to de-emphasise road transportation and revitalize rail transport. It is rather clumsy and amusing that in the 21st century Nigeria, a tanker has to travel from as far as Sokoto, Kano, and Maiduguri etc on road enroute Lagos, just to ferry 33,000 liters of fuel. If we had developed a viable rail mode of transportation, most of the road carnages that result into monumental loss of lives and properties could have well been avoided. The rail option is cheaper, effective and less cumbersome alternative through which millions of liters of fuel and, indeed, people, goods and products could be effectively and effortlessly transported across the country. Hopefully, if the ongoing effort by the Buhari administration to revamp rail transportation sees the light of the day, things would considerably improve. 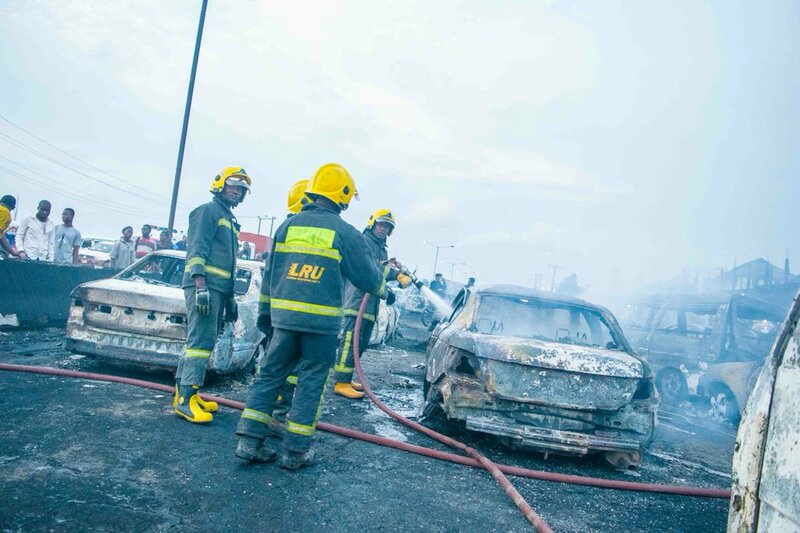 While commemorating with those who lost loved ones and valuables in the ill-fated episode, kudos should be given to operatives of the Nigerian Police, Lagos State Emergency Management Agency, LASE- MA; Lagos State Fire Service; the state’s Ambulance Service; Lagos State Traffic Management Authority, the Federal Road Safety Commission among others who worked tirelessly and endlessly to coordinate rescue and emergency operation that mitigated the effects of the gory episode. Finally, our compatriots need to be more passionate about preserving human lives, especially in times of grievous emergencies. It is absurd seeing that a few people were more interested in taking selfie at the scene of the gory Black Thursday event rather than taking steps to assist in saving lives. This is wrong and inhuman.